Rani Karnaa is the living version of the bronze dancing girl unearthed from the relics of Indus civilization. She has given Kathak a new direction, enriched its repertoire, widened its dimension, and has infused in it rare depth, elegance and dignity. Her quiet, contemplating beauty and grace has rejuvenated this dance form. While living in Delhi she used to go for evening walks at Connaught Place where she found women wearing ghungurus and dancing in the Kathak form. She was attracted by the sound of ghungurus and insisted her father for a pair of same. This was when she was just 7 years old that the spark of Kathak ignited in her. Kathak was her first love and she received training in Kathak from eminent gurus, namely Late. Nrityacharya Narayan Prasad, Late. Sundar Prasad and Pandit Birju Maharaj. She not only learnt Kathak but also pursued and developed her art with an unusual sense of aesthetic adventure. She evolved her own style which was a beautiful synthesis of the Jaipur and Lucknow Gharanas. Her compositions are also aesthetically delightful combinations of Sahitya, Sangita and Abhinaya. Rani has travelled widely and taken her love for Kathak beyond the frontiers of India to the U.K., Russia and many European and East Asian countries. Each of her performances, she modestly agrees, has been received with applause. 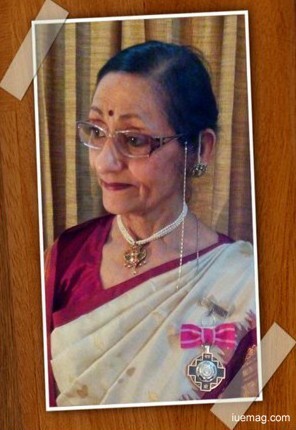 It was Kathak which brought her the first honour - the Vice-President's Gold Medal in 1954, awarded by Shankar's Weekly. Important honours and awards have been bestowed upon her. Her Majesty, the Queen of Laos honoured her with the "Order of the Queen" in 1964. In 1977, her Alma Matter Bharatiya Kala Kendra, New Delhi, honoured her with the title "Sangeet Varidhi". In May 1990, the Indian International Friendship Society, New Delhi, awarded her "Vijay Ratna", in recognition of her contributions as a Cultural Ambassador for India. Samskriti Shreyaskar, a dance academy, has been established under the directorship and guidance of Rani Karnaa. Its aims to study, teach, cultivate, demonstrate and develop the performing arts in general and Kathak, in particular. The students of the academy have already performed at various dance festivals. "I am very hopeful and positive about the young generation. They are very hard working and intelligent. It is very important for the seniors to provide them with the proper guidance and motivation. In order to learn and master a classical dance or any art form one needs a good teacher. The greatest responsibility I think I have as a guru is not only to teach but to guide, support and encourage my disciples in their journey towards becoming an artiste in the true sense of the word," are her words for our young readers around the world. Till date, this 75 year old terrific artist of Kathak, teaches Kathak and Bharatnatyam. Her recent programme that was held on March 23, 2014 at Indira Gandhi National Centre for the Arts, New Delhi, was 'Sajan Raheo Ruh Mein' which was presented by Sindhi Academy, Delhi based on the lyrics of Sindhi Sufi poets. The concept and direction of the programme were done by Rani Karnaa and her senior disciples had given a fabulous performance.